Latin Night on the Water! DJ will be playing Latin and Salsa music aboard the Thomas Laighton. Bring your dancin' shoes. 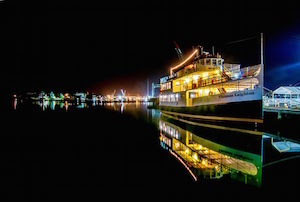 The best party on the Seacoast is aboard the M/V Thomas Laighton! Dance to great music by local bands and DJ's while you enjoy drink specials, theme nights, good company, and amazing scenery. CHEERS! This cruise is 21+ and a valid state issued photo ID is required. Bags are subject to search. Bars are cash only on the high seas!! ATM available prior to boarding the vessel.